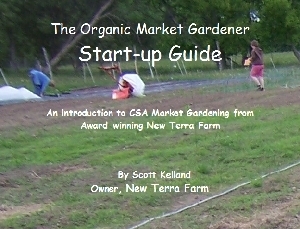 If you want to learn what it takes to start-up, market and manage a successful organic market garden, even on a very small farm just enter a valid e-mail address to get your Free Organic Market Gardening Start-Up Guide. This is the same information that won New Terra Farm the $5,000 Premier's Award, now available to you right now for free. Important Note: the Free Market Gardening Guide will be e-mailed to you immediately, so please make sure you can access the e-mail address you provide. I love being an organic market gardener! And it's a great business. Even though many 'experts' are saying the small farm is D-E-A-D, you can have a thriving organic market garden, growing and selling wonderful fresh vegetables for appreciative customers, on your small farm, or mini farm, or micro farm (or even a big back yard). Here's the truth; despite the 'economy', or the recession, or any other factor, people still need to eat! So market gardening is a great business. And you can start on a small piece of property, or in a big back yard, or even (and you may not believe this) if you don't own any property at all! But . . . to be successful, you need to start with the right information. This can make the difference between a thriving business and painful failure. That's why I wrote the Free Organic Market Gardening Start-Up Guide. If you'd like to own your own successful market garden, growing great fresh natural food that is in high demand and turn your passion for gardening into income, then READ ON! First, let me tell you the story of a beginning market gardener's big mistake. . . I have a good friend and neighbour who started market gardening after I did. In fact, she worked on my farm to learn the business. She was passionate about growing great organic vegetables, she was a hard worker, and in fact she learned a lot about successfully growing for market. But . . . she made a mistake her first year that cost her about $5000 in lost sales! OK, you may find it hard to believe that one mistake could cost so much, but I can verify it is true. Let me tell you the rest of the story . . .
our gardens were about the same size; her's was actually a bit larger than ours (she was eager and ambitious). we have similar soil and growing conditions; our gardens are only about 2 miles apart. we use similar growing techniques; in fact my friend grew many vegetables EXACTLY like we did, because she learned how from us. we grew many of the same kinds of vegetables, using seeds we bought from the same seed houses. - her sales from her first garden were about $4000. That's a difference of $5000 between two very similar gardens! Successful market gardening is just as much about marketing as it is about gardening! 'Scott, don't I HAVE to be a good grower'? 'Scott, if I grow better vegetables than the other gardeners won't customers just beat a path to my door'? And of course, 'Scott, I just don't like marketing'! Here's the deal: You can grow the most beautiful, tasty, nutritious vegetables ever seen, but . . . if nobody knows you have them, nobody can buy them! And, sad to say, people may 'beat a path' to your door, but they probably have to drive past farmer's markets and a lot of other growers to get there! You have to let people know you have a superior product, if you want them to buy it ; you do that through marketing. And, if you are growing great vegetables, you should be proud to tell 'em! So, to sum it up, we didn't grow any better, or work any harder in our garden to make twice as much money; we just figured out a better way to plan, market and manage our garden, to make sure we got paid better for our work! Trust me, I'm a gardener! So, marketing is a key aspect of market gardening (My Free Market Gardening Guide explains this in detail). But you also need a couple of other tricks in your kit; you need to know how to plan your business - i.e. set goals, estimate income and expenses; and how to manage your garden for success. Again, this can be easy or hard, depending on the information you start with. But enough teasing, find out more by getting your Free Organic Market Gardening Start-Up Guide. Yes, I want the Free Market Gardening Guide so I can Avoid the $5,000 Mistake! Just fill in the form below a valid e-mail address to get your Free Organic Market Gardening Start-Up guide. Note: the Guide will be e-mailed to you immediately, so please make sure you can access the e-mail address you provide. And don't worry, it's just between us; we will NEVER divulge, or rent, or sell your personal information for any reason. When you complete the form you will also receive (WOW, even more free stuff!!) a subscription to Market Gardener Minute, my e-newsletter about topics of interest to the market gardener.